The incredible folks at Spartan City Poetry Club have extended an amazing show of generosity towards GOLDEN CROSS Senior Ministries. 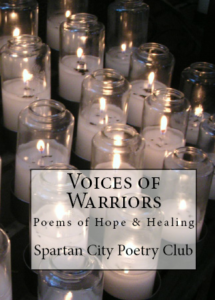 They have just released a most inspirational collection of poetry entitled, “Voices of Warriors: Poems of Hope and Healing”. In this book, you will read poems about courage, confidence, and compassion to encourage the warrior inside of you to be brave, fearless, and strong fighters when facing struggles and conflicts in life. This book will not only help you but help someone else. Your purchase of this amazing book will also support the ministry of GOLDEN CROSS. The Spartan City Poetry Club has chosen to donate the royalties for purchases of the book to assist GOLDEN CROSS in our mission to enhance the daily living and well being of the senior residents of Wesley Living communities. Please “click“ on the book cover below to order yours. In fact, order several! They will make great gifts that will return years of hope and healing. The book release reception is April 22 at the Embassy Suites on Shady Grove near Poplar. Join us for book signings and poetry readings. Purchase your copy of “Voices of Warriors” today!